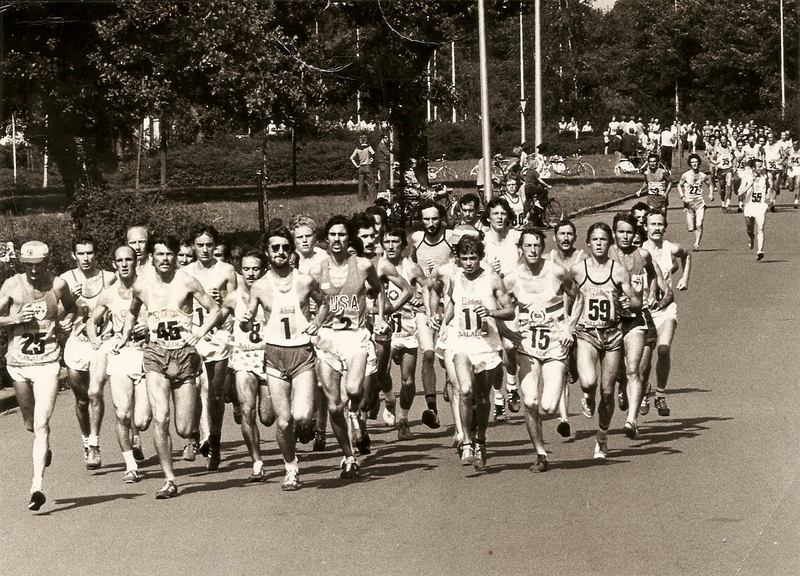 Start of the Enschede Marathon: note Willie Day, Sandy Keith, Jim Dingwall, with others like Ron Hill and Dave Cannon also present. 8/7/79 – the B.L.E. marathon (held at Tullamore in conjunction with the Scotland v Denmark v Ireland Track and Field contest), featured a Marathon International match with two man teams from Ireland (1st), England (2nd), Wales (3rd) and Scotland (4th). For Scotland, Dave Clark was 2nd in 2.18.01; and Colin Youngson 22nd in 2.30.42. 14/9/80 – The Glasgow Marathon included an international team match for the first time – England won from Republic of Ireland, Northern Ireland and Wales. Scotland did not finish. 28/9/80 – The Aberdeen Marathon featured, in finishing order, England v Scotland v Wales v Northern Ireland. Three to count. For Scotland, Graham Laing won in 2.19.33, Don Macgregor was 7th in 2.26.48 (1st Veteran), and Evan Cameron 9th in 2.30.13. 27/9/81 – The Aberdeen Marathon featured, in finishing order, England v Scotland v Wales. Three to count. For Scotland, Don Macgregor finished 3rd in 2.21.52 (1st Vet); Evan Cameron 7th in 2.26.23; and Graham Milne 9th in 2.27.13. 18/10/81 – The Glasgow International Marathon included a match between (in finishing order) Scotland v Wales v Northern Ireland v Eire. For Scotland, Colin Youngson was 4th in 2.19.12, Des Austin 5th in 2.19.19 and Alastair Macfarlane 6th in 2.21.01. All three counters were required. The Scottish team was presented with specially inscribed SAAA gold medals. 19/9/82 – The Aberdeen Marathon featured a match between (in finishing order) Wales v Scotland v England v Northern Ireland. Three to count. For Scotland, Fraser Clyne was 3rd in 2.19.58, Colin Youngson 4th in 2.21.03 and Peter Wilson 10th in 2.26.20. 5/9/82 – The Edinburgh Marathon included a match between (in finishing order) England 7pts, Scotland 23 and Netherlands 25). For Scotland, Lindsay Robertson was third, Sandy Keith 8th and Craig Ross 12th. Three to count. 17/10/82 – The Scotts Porage Oats Marathon in Glasgow, which was billed as the first Scottish People’s Marathon, included a match between (in finishing order) England v Scotland v Wales. (Northern Ireland, Eire and Spain also ran.) Two counters were required. For the official Scotland team, Jim Brown finished 4th in 2.20.38; Evan Cameron was 9th in 2.21.58; and Don Macgregor 10th in 2.22.06. 13/3/83 – Barcelona Marathon. The Scottish team won, in front of Catalunya and Spain. Three to count. For Scotland, Lindsay Robertson finished 6th in 2:2:18:02, Andy Daly was 10th (2:20:09) and Craig Ross 17th (2:22:26). 11/9/83 – The Glasgow Marathon included a match between (in finishing order) Scotland v Wales v England v Northern Ireland v Eire. Three to run, two to count. For Scotland, Peter Fleming won in 2.17.46, Colin Youngson was 4th in 2.19.18 and Andy Daly 6th in 2.19.30. For the first time, due to sponsorship by a Japanese firm, a Scotland tracksuit, shorts and vest were given to each of the three team members; and later on, engraved glass trophies were handed over. John Fairgrieve was team manager. (Later in the decade, sponsorship was given by an American firm, and Scotland wetsuits as well as tracksuits, shorts, teeshirt and vest were handed out liberally). 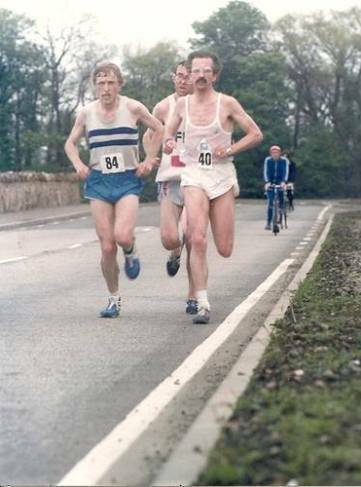 18/9/83 – The Aberdeen Marathon included a match between (in finishing order) England v Wales v Northern Ireland v Scotland, but we did not finish a team, since Graham Laing dropped out at 18 miles after leading to 14 miles. For Scotland, Peter Wilson was 6th in 2.21.53 and Don Ritchie 9th in 2.25.20. 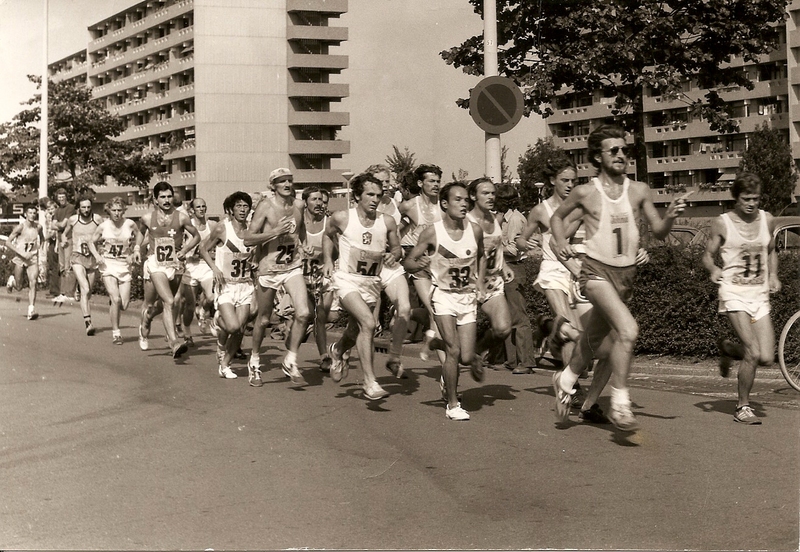 18/3/84 – The Barcelona Marathon included a match between many nations. The first three to finish were: Catalunya, Spain and Scotland. Three to count. For Scotland, Lindsay Robertson finished 6th in 2.16.15, Peter Wilson 21st in 2.21.42 and Colin Youngson 28th in 2.26.04. John Fairgrieve was team manager. 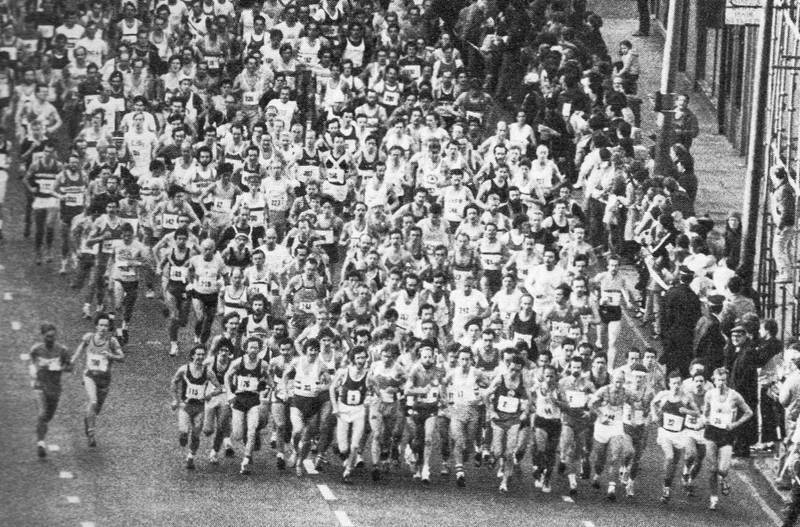 30/9/84 – The Glasgow Marathon included a match between (in finishing order) England v Scotland (did not finish) v five other countries. Two to count. For Scotland, Jim Dingwall was 5th in 2.16.44 but Peter Wilson did not complete the course. 16/9/84 – The Aberdeen Marathon included a match between (in finishing order) England v Scotland v Eire v Northern Ireland. For Scotland, George Reynolds was 2nd (and SAAA champion) in 2.21.04, Charlie Haskett 4th (2.21.37) and Colin Youngson 6th (2.23.36). 17/3/85 – The Barcelona marathon featured an international team match against top continental opposition. Scotland finished first team with three runners in the top six. For Scotland, Paul Kenney finished second in 2.18.34; Tony Coyne was third in 2.21.33; and Mike Carroll sixth in 2.22.31. 1/9/85 – The Edinburgh Waverley Market Marathon included a match between (in finishing order) Scotland, Wales, Eire and England. Three to run, with two to score (with positions added for a cumulative total). For Scotland, Mike Carroll won in 2.18.41; Scott MacDonald (Swindon) was second in 2.22.01; and Murray McNaught tenth in 2.27.54. [Certainly, as far as the Welsh team was concerned, this was an international match and Scotland won clearly with a total of 3 points (1st and 2nd places)]. 15/9/85 – The Aberdeen Marathon included a match between (in finishing order) England v Wales v ‘Europe’ v Scotland. Three to run and three to count. For Scotland, Colin Youngson finished 2nd in 2.23.58, Craig Ross was 12th in 2.38.14 and Don Ritchie 36th in 2.57. 43. Craig and Don got into considerable difficulties and did well to finish on the new, tougher course. 22/9/85 – The Glasgow marathon included a match between (in finishing order) England v Wales.v Scotland. Mike Carroll from Annan & District (2.18.24) finished 6th, with Don Macgregor (2.19.36) 10th (and first veteran yet again). Those two beat all of the official Scotland team: Jim Brown (12th in 2.19.50); Graham Getty (24th in 2.23.25); and Evan Cameron (39th in 2.26.39). 18/5/86 – Wales hosted a four nation fixture at Bridgend, which incorporated the Welsh Championship and a match between (in finishing order) England v Catalonia v Wales v Scotland. Two counters were needed; and a cumulative time. For Scotland, Frank Harper finished 7th in 2.29.49; the other Scots were Doug Hunter and Keith Lyall. This was a two-lap, extremely hilly course. 25/5/86 – The Aberdeen Marathon featured a match between (in finishing order) England and Scotland. Four to run, three to count. For Scotland, Colin Youngson finished 4th in 2.27.56, Allan Adams was 5th (and first veteran) in 2.29.10, Doug Cowie 8th in 2.34.37 and Don Ritchie 9th in 2.36.53. 21/9/86 – The Glasgow Marathon included a match between (in finishing order) England v Wales v Scotland. For Scotland, Frank Harper finished 4th in 2.18.44; Allan Adams was 15th and first veteran in a ‘lifetime best’ 2.23.03; and Murray McNaught 23rd in 2.26.04. 24/5/87 – The Aberdeen Marathon included a match between (in finishing order) England v Scotland v Wales. Four to run, three to count. For Scotland, Rob Hall was 3rd in 2.29.54, Doug Cowie 6th in 2.30.49, Bobby Ronald 10th in 2.31.09 and Don Ritchie 11th in 2.34.27. 5/7/87 – The Bridgend Marathon, which was the Welsh Championships over a tough course, included an international team contest. The finishing order was: Wales, Scotland, Catalonia. For Scotland, Davie Watt was 2nd in 2.28.50, Craig Ross 6th in 2.43.46 and Samuel Graves 7th in 2.50.27. 20/9/87 – The last Glasgow Marathon did not include a true International team match. Glasgow (Daly and Robertson) won an Inter-City contest, beating Cardiff and Dublin. First Scot was Terry Mitchell (2nd in 2.19.40) and 3rd was Hammy Cox (2.19.43). Brian Carty finished 17th and first veteran in 2.25.18. 22/5/88 – The Aberdeen Marathon included a match between (in finishing order) Scotland v England v Wales. Four to run, three to count. For Scotland, Hammy Cox won in 2.21.15, Frank Harper was second in 2.22.20, Doug Cowie 6th in 2.26.21 and Colin Youngson 10th (and 1st Veteran) in 2.28.38. Engraved plaques were the team prizes. June 1988 – The Nuremberg Marathon included an international contest featuring a Scottish team. Hammy Cox won the race; and the other two Scots were Colin Martin and John Duffy (possibly in a time of 2.24.40). 18/9//88 – The Anglesey Marathon included an international contest, featuring (in finishing order) Wales v Northern Ireland v Scotland v Spain. The island course was a tough, undulating one. For Scotland, Sam (or Ian) Graves finished tenth in 2:34:22; John Duffy 12th in 2.37.12; and Rod Bell 18th in 2.40.55. 20/3/89 – The Barcelona Marathon included a team result (in finishing order) of Wales, Scotland, and Catalonia 3rd. Hammy Cox finished 6th (possibly in 2.18.05); Allan Adams may have run 2.26.32; and Colin Martin was the other Scottish team member. Welsh runners were: 13 Tegid Roberts 2:24:40, 18 Arwel Lewis 2:27:02 and 24 Dic Evans 2:29:29. 28/5/89 – The Aberdeen Marathon included a match between (in finishing order) England v Scotland v Wales. Four to run, three to count. For Scotland, Terry Mitchell was 2nd in 2.24.53, Rob Hall 2.29.35 and Colin Youngson 7th (and first veteran) in 2.31.23. Alan Robson did not finish. 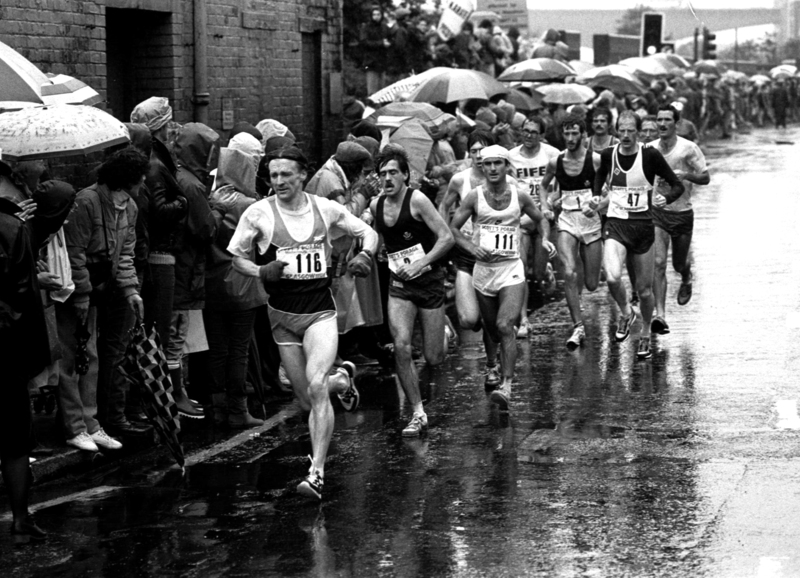 10/9/89 – The Anglesey Marathon included the Welsh Championships and Commonwealth Games Trial. Included was an international contest (3 to run, all 3 to score) between (in finishing order) Wales (1,3 and 9), Northern Ireland (4,6,7) and Scotland (dnf – 2, 5). For Scotland, Charlie McIntyre finished 4th in 2.31.56 (but 2nd in the team contest) and Doug Cowie 8th in 2.39.06 (but 5th in the team contest. There is no record of the third Scot who dropped out, unless Scotland only sent two runners. 27/5/1990 – The last Aberdeen Marathon included a match between (in finishing order) England v Wales v Scotland. Four to run, three to count. For Scotland, Charlie McIntyre finished 4th in 2.26.50, Don Ritchie 7th in 2.31.00, and Doug Cowie 10th in 2.32.55. Colin Youngson did not finish. 22/7/1990 – The Luton Marathon included a match between (in finishing order) Wales and Scotland. For Scotland, Charlie McIntyre finished third in 2.30.00; Frank Harper 7th in 2.33.34; and Doug Cowie, who unfortunately twisted his ankle on the morning of the race, 14th in 2.45.07. Three counters were necessary so, against advice, the brave lad felt that he had to run. Scots were invited to the Las Vegas Marathon on an all-expenses trip but there is no evidence of a team race. Hammy Cox and Alan Robson tackled the full distance; and Peter Fleming the Half Marathon. 28/8/88 – The Livingston Half Marathon included an international match, featuring (in finishing order): England v Scotland v Northern Ireland v Wales. Three to run, two to count. For Scotland, Peter Fleming finished third in 65:13; Charlie Haskett fourth in 66.26; and Hammy Cox 13th in 70.16. NB Apparently, there was also a Half Marathon international at Livingston on 30 Aug. 1987.